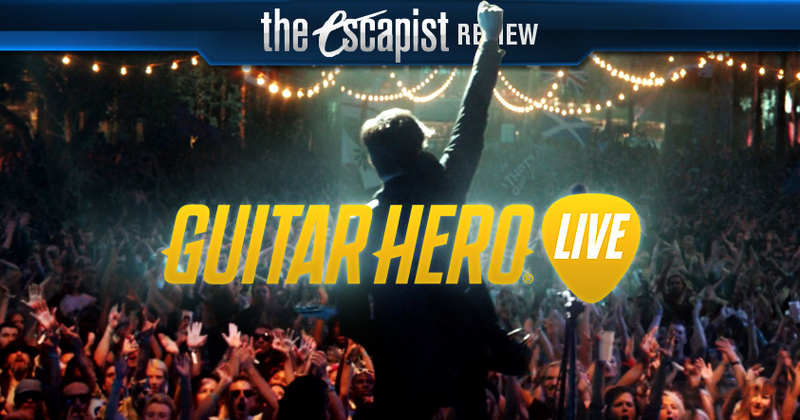 Guitar Hero Live Review - We'll Do It Live! Developed by FreeStyle Games. Published by Activison. Released on Oct. 20, 2015. Available on PlayStation 4, Xbox One, Wii U, PlayStation 3, iOS, and Xbox 360. Review code provided by publisher. While Harmonix took the relatively safe route with Rock Band 4, providing an adequate revival of its franchise without deviating from the mold, FreeStyle Games went in an entirely different direction with Guitar Hero: Live. This is a game that from the ground up is fundamentally different than all Guitar Hero and Rock Bands before it, going as far as to completely redesign the button layout on the guitar peripheral as well as implementing a brand new way to look at downloadable content for music games. It's a surprisingly innovative title in a series that has always seemed to be playing catch up to Rock Band, and while not all of the changes are for the better, it's nice to know that Guitar Hero: Live actually provides an alternative rhythm gaming experience, as opposed to being Rock Band with a different art style and song selection. 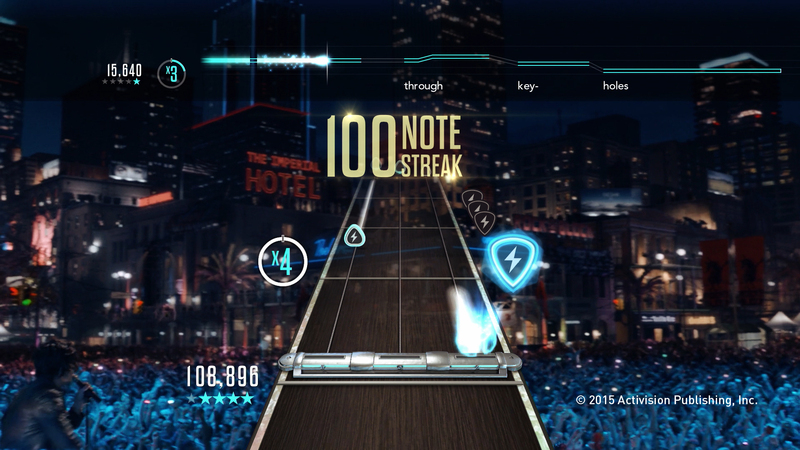 The biggest change in Guitar Hero: Live is its guitar peripheral, which now has six buttons across three frets, with one black and one white button on each fret. This completely changes how the game is played, and even someone like me, who has been playing exclusively on expert since Guitar Hero 2, had to spend a good amount of time adjusting and training my brain before I was able to settle in on the advanced difficulty, which is the second hardest difficulty offered. While it's nice to have a new type of challenge to overcome, the downside to the new gameplay offered by the six button guitar is that it can often be information overload. Not only do you have to deal with six possible buttons to press on a three lane note highway, but you also have to deal with open note strums, poorly notated hammer ons/pull offs, and most importantly, all of the combinations of chords that you can perform. When all of that information comes flying down the highway at breakneck speeds, even the easiest songs become overwhelming. This leads to the problem of Guitar Hero: Live lacking that sweet spot. Advanced is often too easy, while expert is almost always too hard. On the presentation side, Guitar Hero: Live once again seeks to set itself apart from both its predecessors and its competition, and once again the results are a mixed bag. 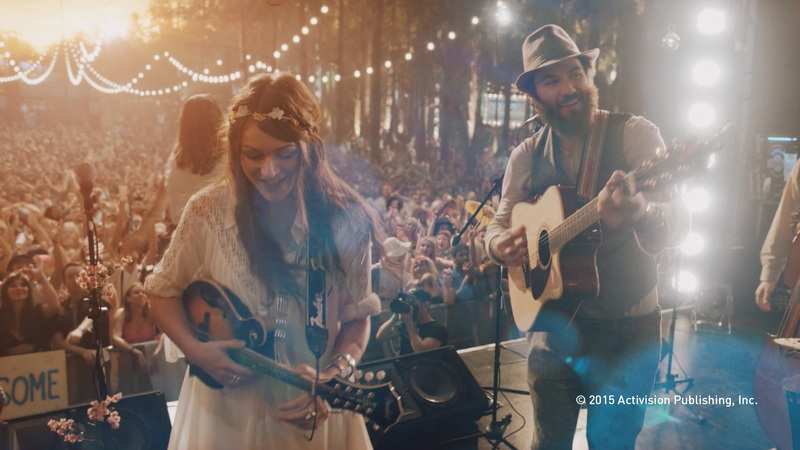 The game uses live action footage from two fictional concerts: Soundial and Rock the Block. Each set list puts you in the shoes of the guitarist of a different cover band as they take to the stage and perform in front of an actual live crowd. GH: Live does some cool things to really make it feel like you're at an actual concert: Fans sing along, your singer will pump up the crowd in between songs, and there's some great pyro effects that accentuate big moments of certain songs. At the same time though, as much as GH: Live wants to make you feel like you're living this fantasy of being a guitarist at an actual concert, it often does the opposite by trying too hard in making the player absurdly aware of whether they're playing well or poorly. One look out at the audience and you'll find a multitude of signs that say banal things like "You're doing good!," "I'm having a great time!," "This is awesome!," and "Soooooooo Good!." Of course, the reason for these signs is so when you start playing badly, they're easy to flip to say "You're doing bad!," "I'm bored!," "This is awful!," and "Sooooooo Bad!." While it can be amusing at times to see everyone scowl at you like you're the scum of the earth when you start playing poorly, the mechanic really could have benefited by having a neutral state. As it is, people act as though you're playing like the second coming of Jimi Hendrix, or you're a the equivalent of a 3-year-old with a Fisher-Price Rock and Learn guitar toy. Worse still is the fact that you can play a song nearly flawlessly up to the very end where you miss a few notes, causing the crowd to all of a sudden turn on you. Also disappointing is the on-disc soundtrack itself, which focuses almost entirely on songs from the more modern end of the music spectrum. There are a couple of classics that have been featured in previous Guitar Hero and Rock Band games, such as "Won't Get Fooled Again," and "Paint it Black," but other than those, there aren't very many songs that I would consider going back to with any regularity.